The Datascape was created when King Mickey digitized the contents of Jiminy's Journal in order to solve the mysterious messages that appeared in it. The worlds within are, for the most part, the same as their real counterparts, which Sora visited during the course of Kingdom Hearts. They appear in Kingdom Hearts coded, and its remake, Kingdom Hearts Re:coded. 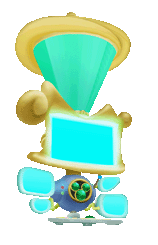 The Datascape is created when King Mickey digitizes Jiminy's Journal in order to find out the secret behind the mysterious message. As the simulation is constructed, Bug Blox begin appearing within it. King Mickey decides to create Data-Sora to explore the journal and eliminate the bugs, and focuses on monitoring the situation from the outside. After Data-Sora removes the bugs in the data-Wonderland, Data-Riku secretly pulls Mickey, Donald, Goofy, and Jiminy into the datascape. They discover this once Heartless begin appearing, and the doors out of the room are found to be locked. Outside the datascape, Chip and Dale attempt to communicate with the heroes, but are unsuccessful. After Data-Sora removes the bugs from the data-Olympus Coliseum, he discovers that the real Pete has infiltrated the datascape, and follows the villain to the data-Agrabah. Soon afterward, he catches up to Pete, who reveals that he was spying on the King and his friends when Data-Riku pulled them into the datascape, and then convinced Maleficent to take the both of them into that strange new world in order to conquer it. Maleficent sends Diablo to King Mickey to show that she is holding Queen Minnie hostage, and once he arrives at Disney Castle, Maleficent reveals that Master Xehanort told her about the seven pure hearts of light, and demands that the King hand over the datascape, still set on using it to further her plans. Later, Young Xehanort reminds Sora of the times he's been in Traverse Town. He refers to the Traverse Town "in the datascape", although it is uncertain what Sora knows about his data counterpart and his journey. This page was last edited on 10 April 2019, at 18:04.